For the past few weeks, I've been covering some of the things I did on my trip to London. Broadway Market was great, but of all the places I visited on my short trip, the food was probably the most memorable at Borough Market. 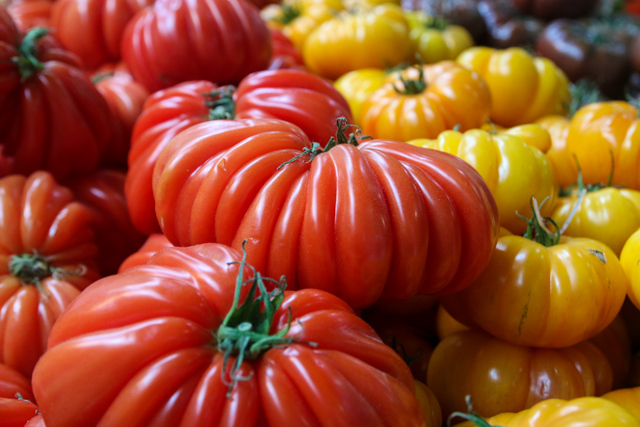 The market is renowned throughout the city for its fantastic produce, artisan food makers, and also for being a historical landmark. 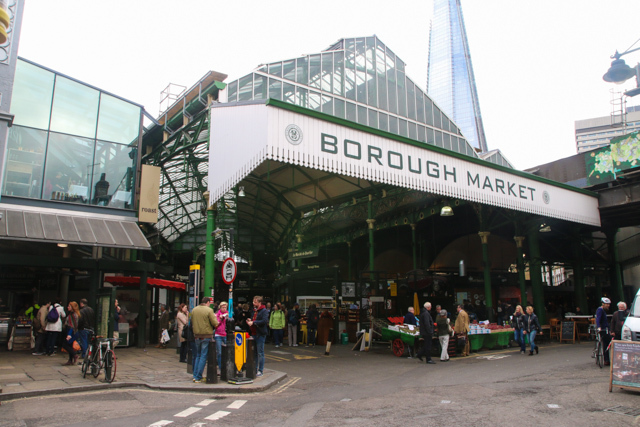 The history of Borough Market is traced back to the 11th century when food traders would gather at the London Bridge. In the 13th century, the market was moved a little ways away to what is present day Borough High Street. 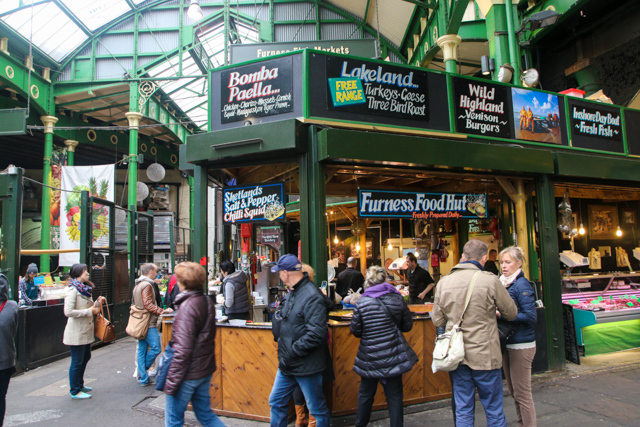 Though it has gone through a number of changes and upgrades, it still thrives today, and is a popular place to visit when you're in London, and especially if you love food. 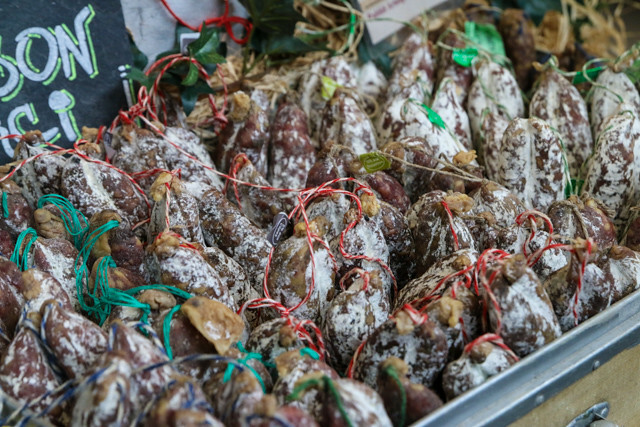 There are over 100 individual stalls at Borough Market, so it's not overly huge, but it's big enough to have a good range of things to choose from and to browse around. 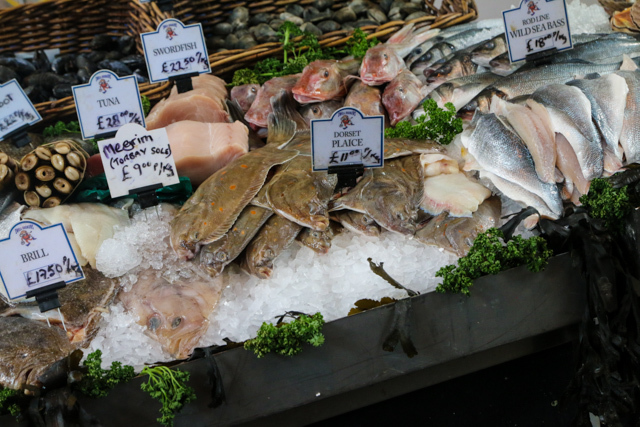 You'll find quite a few vendors selling fresh seafood and produce, as well as many vendors who sell pre-made food ready to be eaten. The fresh vegetables and fruit looked wonderful, and I wanted to buy some ingredients and cook them myself, but with no kitchen in my hotel room, I settled for the pre-cooked food. As soon as you walk in the main entrance of the market, there's a stall that sells a variety of tempting baked goods. The most prominent item on display was their pyramid stack of cheese and olive sticks, and since my mouth was already watering, I quickly bought one. The bread stick was crispy on the outside, lightly oily, and embedded with salty cheese and bits of olive. It was very tasty. The next thing I came across was a sausage on a stick, one of the great things in life. I'm a huge fan of English mustard, which has a nice kick to it. 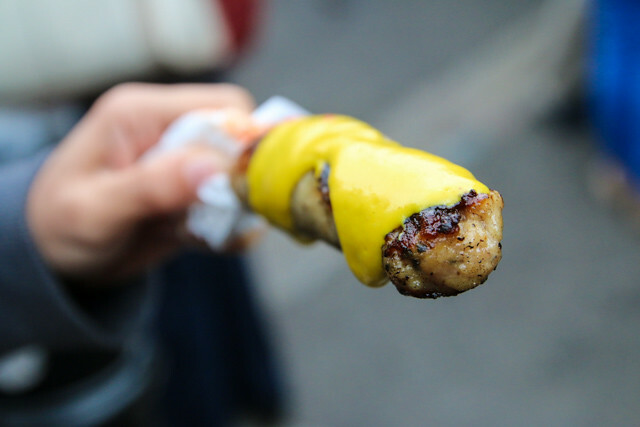 After ordering my sausage on a stick, which came right off the grill, I proceeded to lather it in a thick layer of mustard. The sausage was salty and tender, and the extra mustard gave it the perfect touch. 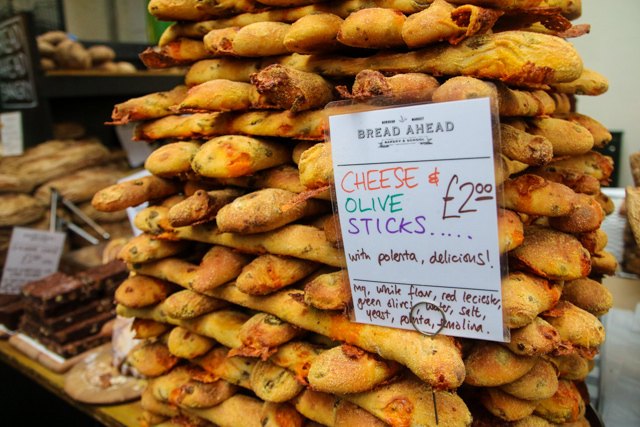 If you enjoy sweets, you'll find plenty of things to snack on throughout Borough Market as well. 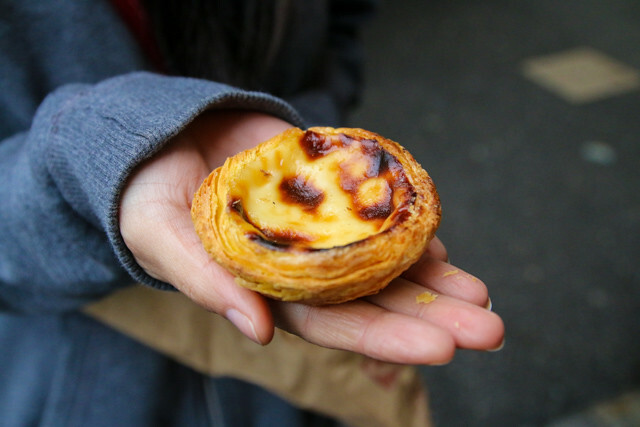 I'm not a huge sweets fan, but my wife is, and she enjoyed her Portuguese pastel de nata, a flaky pastry filled with sweet egg custard. There are no shortage of things to eat at Borough Market, and if you're like me, your wallet will run out before you stomach space does. In order to not empty my bank account, I had to choose wisely. 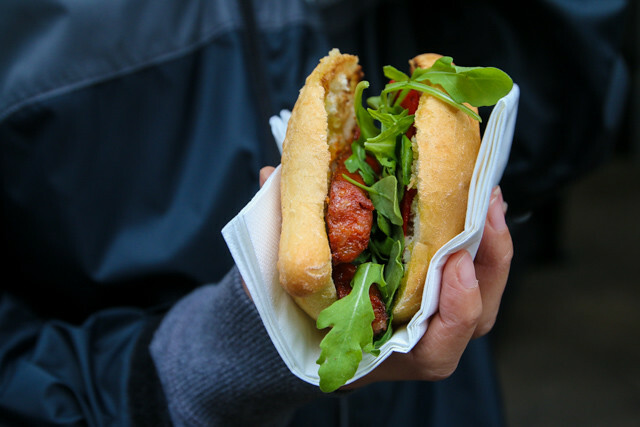 I chose a chorizo sandwich from a famous Spanish foods shop on the corner of the market known as Brindisa. The chorizo was flavorful, slightly spicy, and was accompanied by some fresh leaves of rocket, and a fragrant and sweet roasted red pepper. 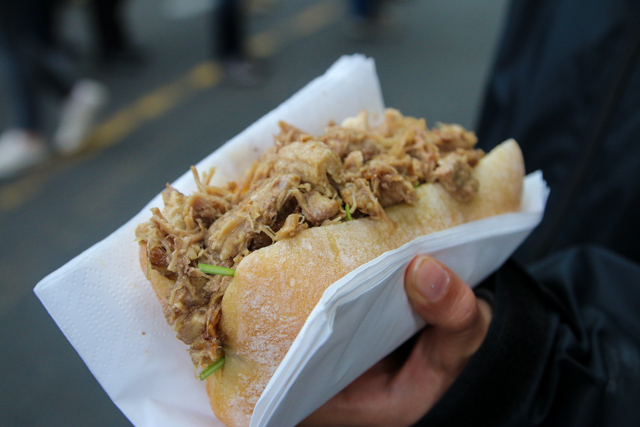 Like I mentioned, I really wanted to try more food at Borough Market, like the fresh pasta dishes, and salt beef sandwich vendor, but finally I had to choose just one more thing, and I decided to go for the duck confit sandwich from Le Marché du Quartier. The sizzling duck was piled into a buttered ciabatta roll, and I couldn't wait to start tearing into it. The duck was incredibly tender, and had a beautiful smokiness to it. I would have liked it even more with a generous scoop of English mustard on top, but it was still good. Though Borough Market may cater to many tourists these days, I think it's still a wonderful place to visit when you're in London, and a great place to eat delicious food. So glad you enjoyed the market it’s one of my fav places in London (used to work around the corner). Next to Shakespere’s The Globe, London Bridge, Clink Prison, some amazing old pubs & The Embankment along the Thames. Man is my mouth watering. That duck confit sandwich is making me get off the laptop after this post and head out for lunch!